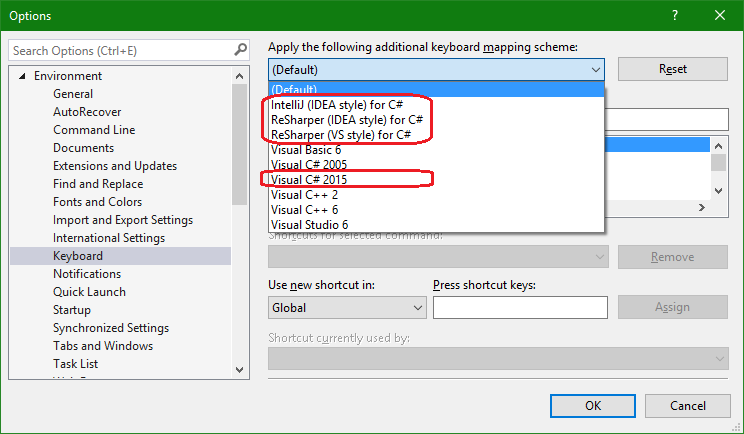 Installs alternative keyboard mapping schemes to work with Visual Studio. Provides rich hotkeys and keyboard shortcuts. Brings to life all your favorite shortcuts from other editting tools. The mappings defined attempt to use the Hot Commands features if they are available. (ie. Toggle Comment is mapped to Ctrl+/ ) This will light up if the user installs HotCommands. I have included a bunch of fixes and enhancements to Visual Studio command mapping that bring to life new functionality with the keyboard. For instance, Ctrl+Plus/Minus will expand/collapse regions in the editor. Alt+1 opens and closes Solution Explorer; Alt+9 = Team Explorer ; Alt+0 = Output window. I have fixed a bug so now you can use the standard Windows keys Ctrl+PgUp/PgDown to move to the next/previous document tab. I have hooked up shortcut keys for GoToNext/Previous member. ....And some other minor improvements. or leave feedback on the GitHub repo issues page.